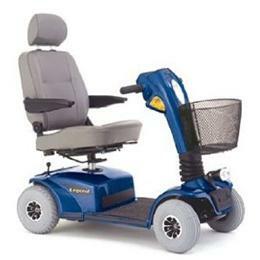 The Legend is Pride's top of the line 4 wheel scooter. Not only can it reach speeds of up to 5.75 mph while safely carrying up to 350 pounds, but it also includes a unique lockup system that makes disassembly and reassembly a simple task. The Legend goes beyond standard scooter design by including a rear suspension that keeps the scooter's wheels on the ground while taking the bumps out of the road. Safety is no afterthought with the Legend either. A dual-bulb adjustable headlight illuminates your path at night and there is a tiller mounted headlight that keeps you visible. The front of the Legend has been reinforced to keep your scooter looking and functioning great for years to come. During this time the Legend's reclining high-back seat with adjustable headrest will make sure you enjoy the ride.